A photo of Special DX No. 3269. 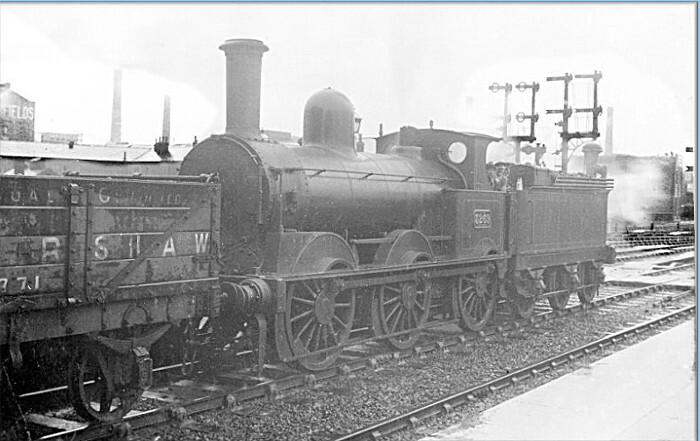 The inscription on the top plank of the wagon reads: 'COAL Co LIMITED'; on the third plank 'ERSHAW'; and the last (?) three digits of the number are '771'. But where and when, and what else can you tell us about the loco, wagon or location? Is this Warrington Bank Quay? The factory in the background could be Crosfields Soap Works. I believe the wagons are from Bickershaw Coliery near Leigh. At least three DXs bore the duplicate number 3269. As the picture looks fairly late but not too late (Webb buffers, wooden brakes), I would go for old number 1397 which was renumbered in August 1909 and withdrawn in September 1913, suggesting a date around 1912. The loco is definitely standing on the fast line in Bank Quay Station, Warrington facing north and it looks like it is waiting for the road. In the foreground is the southbound platform. Almost certainly the wagon is from Bickershaw Colliery so it looks like it is going back home.